This sleeveless, white coloured kurti by Nikhaar comes in cotton. It has a V-neck and embellished floral pattern on the front. This comfortable kurti is best suited for party wear and pairs well with white leggings/chudidars. Ladies Indo Western Top Kurti. Our team of expert designers have manufactured these designer tunic using best quality fabrics, threads and allied material. Due to their latest designs, attractive patterns and beautiful colors, these tunics can be worn at both casual and party occasions. Nikhaar presents to you this beautiful white, sleeveless kurti. It has a V-neck with embroidered floral highlights. It also has black vertical patterned stripes on the front. This cotton kurti is best suited for party wear and pairs well with black leggings. To manufacture these kurtas our professionals make use of excellent quality fabric and imported threads. These kurtas posses many quality attributes like smooth texture, skin-friendliness, shrink & odour resistance and color-fastness. This sleeveless, blue coloured kurti by Nikhaar comes in cotton. It has a round neck and embellished block pattern on the front. This comfortable kurti is best suited for casual wear and pairs well with white leggings/chudidars. attractive designs and stylish look. Further, to meet the diverse requirements of the client, we are offering these tunics in many attractive designs, patterns, prints and colors. Clients can avail these tunic kurtis from us at competitive prices. We are listed amongst the leading organizations, engaged in offering excellent quality Ladies Fashion Top Tunic Kurti. The offered range of top tunic kurtis is hugely acclaimed among clients for its striking patterns, attractive designs and stylish look. Further, to meet the diverse requirements of the client, we are offering these tunics in many attractive designs, patterns, prints and colors. Clients can avail these tunic kurtis from us at competitive prices. Nikhaar Creations is one of the leading manufacturers, exporters, wholesale suppliers in the production of Desigenr Ladies Kurtis/Tunics/Kurtas/Tops.We have attained our achievements by obtaining the best quality products.We supplied fashionable trends..
Nikhaar brings to you this beautiful, white, sleeveless kurti. 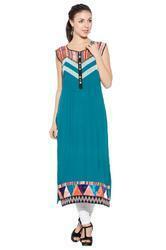 It has a round neck with a slit, pin tuck detailing and embellished highlights. 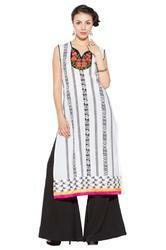 This cotton kurti is best suited for casual wear and pairs well with white bottoms. attractive designs and stylish look. Further, to meet the diverse requirements of the client, we are offering these tunics in many attractive designs, patterns, prints and colors. Clients can avail these tunic kurtis from us at competitive prices.